Condo meublé avec beaucoup de goût dans une belle communauté fermée. Très bien situé à proximité de toutes sortes de terrains de golf, de grands sites sportifs, de bons restaurants, de la vie nocturne, des boutiques et des destinations touristiques. Unité entièrement équipée, Wi-Fi gratuit et câble inclus. Vous n'avez rien à apporter, sauf vos clubs de golf et votre maillot de bain. Capacité d'accueil jusqu'à 6: un lit queen, deux lits jumeaux, un canapé sort pour un lit de taille. A quelques pas de la piscine d'eau salée chauffée, 24 h. salle de fitness et le bain à remous. Barbecues au gaz sont disponibles pour la commodité des résidents. Assigné parking couvert, système de sécurité, télévision par câble et accès internet wi-fi gratuit, tous les draps, serviettes, vaisselle et ustensiles de cuisine sont fournis. We really enjoyed our stay at Desert Breeze! It had everything to make our vacation a blast. The condo was well equipped with supplies! We really liked spending time at the pool. The condo is in a great location. We would definitely stay in Desert Breeze again!! Nice escape from the rain and snow !! We enjoyed our month at Desert Breeze and wanted to stay longer. The unit was very comfortable and the complex was gated and secure. Central location for freeway access, baseball training camp and golf. The Pool and Spa were a welcome respite after a round of golf. Dene was a great host and attentive to our every need. We will definitely be back ! Glad you enjoyed your stay with us, Marilyn. We had a perfect sun escape to Phoenix, stayed at Desert Breeze Villas. Our unit was very spacious with a great view of the lovely landscaped grounds and heated pool. We swam daily. The pool was fantastic & great for lap swims. Enjoyed friendly conversations with many residents. Also appreciated the updated gym. Location too was ideal, easy access to everywhere. We would definitely stay here again. Especially appreciated working with Dene, very responsive. Thank you! Thanks for the kind words, D&R! This condo is attractively furnished and has a great floor plan. The layout with a bedroom and full bath on opposite sides of the great-room gives lots of privacy. The major appliances in the kitchen are new. We did have trouble with the clothes dryer while we were there, but Dene, the property manager, was very responsive. We love the location of the complex: it is close to Camelback Ranch for Spring Training games and an easy hop onto the 101 loop to get to other places such as the University of Phoenix Stadium and Westgate quickly. 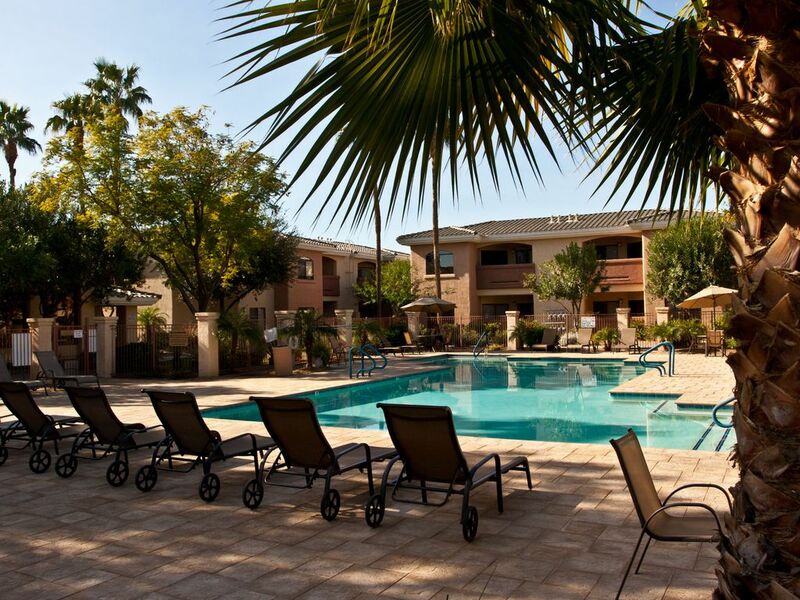 We’ve been staying at Desert Breeze condos represented by Purgatory Properties Management since 2009. We’re planning on returning in 2018 and beyond. Our rental #156 is a tastefully appointed 2 bed room 2 bath unit. This year we discovered new appliances in a fully equipped kitchen. Major league spring training baseball is one reason for our journey and this west side location provides easy access to I-10, the 101 and other major roadways. Local restaurants, craft breweries, tap rooms, golf courses and shopping malls are only a few miles away. glitches-namely loss of cable or Internet service- that we’ve experienced he’s reacted immediately and corrected the issues. Desert Breeze offers 1st class accommodations and a great value! I hope that they have units available for your dates. Près de tout! Phoenix a plus de terrains de golf que vous pouvez secouer un club de golf au !!! Marcher ou de conduire 5 minutes dans toutes les directions et vous pouvez en trouver un! Condo est de 24 minutes de l'aéroport international Sky Harbor, à seulement 5 minutes de University of Phoenix Stadium, Glendale Spring Training Complex, Peoria Sports Complex, Stade de hockey Phoenix Coyotes, Westgate Centre et de l'aéroport Glendale. 17 minutes à Phoenix International Raceway. À 15 minutes du Zoo & Aquarium World Wildlife. Des tonnes de grands restaurants et boutiques à proximité. Faites de la randonnée dans le désert sur les chars blancs Regional Park à 25 minutes. En 45 minutes vous pouvez être à Lake Pleasant. Il ya toujours quelque chose de cool passe à Phoenix. Demandez-nous, nous allons vous dire ce qui se passe. Weekly Rate: $750 - $850 Monthly Rate: $2800 - $3200 Weekly winter rate is $850 (Oct. 1st thru April 31st). Additional days @ $120 / night. Call for summer rates. For 3 consecutive winter weeks get a $100 per week discount. Longer leases are available. Cleaning fee is $95. $400 security deposit or $49 renter's insurance. 50% is due upon reservation. Balance is due prior to arrival.